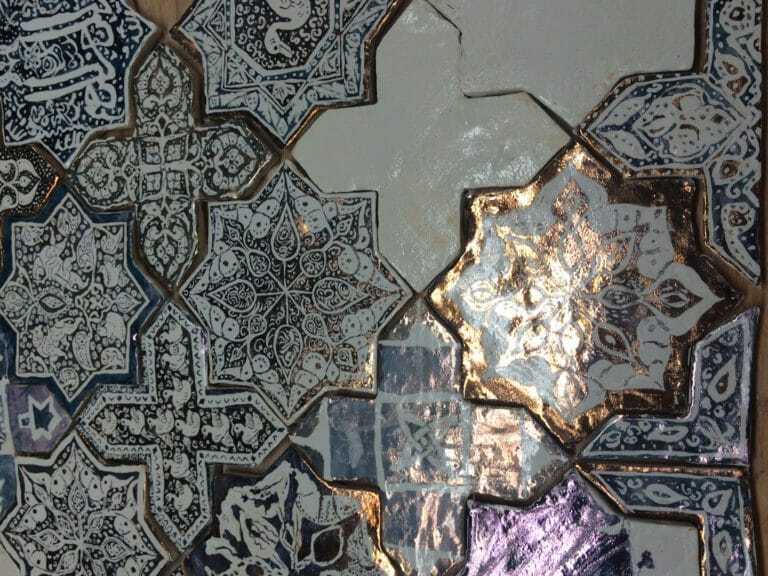 We enjoyed visiting a course which the Bagri Foundation supported on Kashan Tiles at The Prince’s School of Traditional Arts from 15 – 19 August 2016. It was fantastic to see some of the stunning work being created and we felt jealous that we weren’t making it ourselves! Boris has been creating ceramics for 15 years, creating both functional and artistic pieces. He has been inspired by traditional Islamic techniques and reshapes them with contemporary twists as well as British motifs. The hare is a popular image in his Kashan influenced compositions. Watch a video of Boris in action here: View some examples of his ceramic masterpieces on his Instagram page. The students learnt the techniques and motifs behind medieval Kashan pottery, drawing inspiration from traditional motifs such as the eight pointed star and the cross. We discovered that blue, almost lapis lazuli in its shade and rich turquoise are common colours which are paired with copper or gold leaf lustre. For this course, Boris gave the students a bit of a luxury and used gold and platinum lustre. Often the tiles have inscriptions around the edges in various Arabic scripts possibly cited from the Quran or from Persian poetry. The students learnt how to construct the Kashan inspired shapes, creating an 8 pointed star in clay as well as creating various other templates. A few students had created their own collage compositions of various shapes and designs. These templates were then glazed and fired, after their designs were drawn on to the tiles with brushwork using a black resist which created the spacing in the composition. The lustre was set before going into the kiln. You would need scratch through the resist to reveal the final design. How the final piece looked would be a surprise to students until it came out of the kiln. Luckily they embodied the beauty of Kashan tiles, taking inspiration from their colours, fine lustre and mirror glazed sheen. This course was part of the Bagri Foundation Open Programme at The Prince’s School of Traditional Arts, which aims to expand the Asian arts courses at The School. Coming up next on the Open Programme is an Introduction to Naskh Script with Koichi Honda.